Manuka honey is only produced in New Zealand and created by bees who pollinate the manuka bush. The honey is much more costly than regular honey as it is used not only for sweetener but as a supplement. All types of honey have a very mild antiseptic property because they contain hydrogen peroxide. It is only Manuka Honey that has the additional and more powerful antibacterial property. Manuka honey has a bitter flavour that is not as sweet as regular store honey. Manuka honey can be used for so many great reasons, from healing a scrape or burn to helping with cholesterol and inflammation. Manuka Honey is measured in two forms of ratings UMF and MGO. In short, both raitings are sed to indicate the antibacterial strength however UMF measures the antibacterial performance and MGO measures the methylglyoxal content. UMF is more established of the two. It is an internationally registered trademark and can only be used by licensed companies who have met certain criteria including that the product is natural and has Manuka's unique non-peroxide antibacterial activity. For example, A UMF rating of 20+ is equivalent in strength to a 20% solution of phenol. Manuka Honey with a UMF rating of more than 10 is highly active honey and is referred to as "Active Manuka Honey"
MGO™ ratings refer to the level of Methyglyoxal in the honey. So what is Methylglyoxal? It is a compound found in the pollen of the Manuka tree’s flowers, a New Zealand native tree. Methyglyoxal is a marker of Manuka honey but it does not cause the non-peroxide activity. 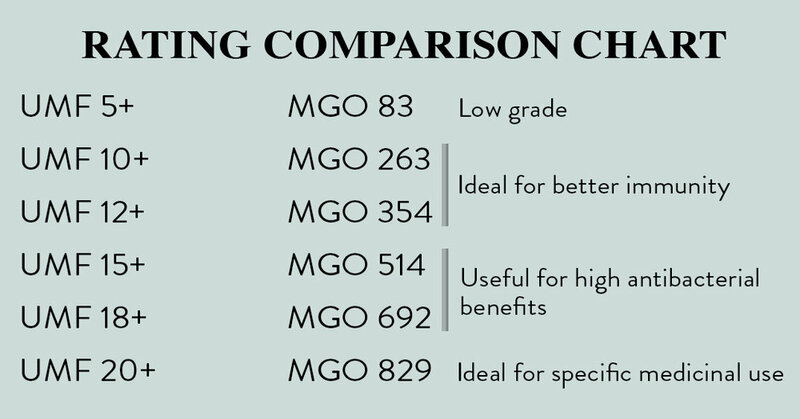 MGO™ is a trademark of Manuka Health New Zealand Ltd, and you will only see MGO™ labels on their own products. They state that the higher the MGO™ rating in Manuka honey the higher the level of anti-bacterial activity in the honey. MGO™ is trademarked by the Manuka Health New Zealand Ltd and you will only see it on their products.